Thompson San Antonio Hotel and The Arts Residences will be located on the San Antonio River Walk. Architecture is by Powers Brown. 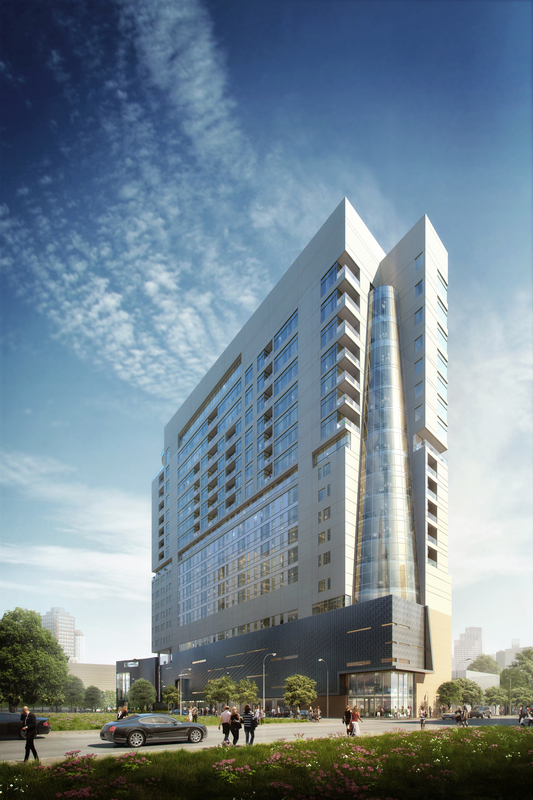 SAN ANTONIO – Houston high-rise condo developer Roberto Contreras, CEO of DC Partners reports the Arts Residences at Thompson San Antonio Hotel is 65 percent sold, including three penthouses. The 61-unit project, slated for completion in early 2020, will sit atop of a new Thompson Hotel. The condos are priced from the high $400s to $4.5 million for the penthouses. The Arts condominiums are located on the River Walk, within walking distance of the Tobin Center for the Performing Arts. “As this graceful, structure begins to take form and shape over the coming months, I hope the people of San Antonio will be awed by its timeless beauty and inspired architecture,” said Contreras. The Powers Brown team calibrated The Arts Residences’ design to elements of the Tobin Center for the Performing Arts, across the street, using metal panels that index the river and mirror those of the Tobin. They balanced traditional materials and scale with a certain modernism, carefully choreographing the building’s crown and its inside-outside reciprocity to create what both the developer and the architect believe will be a truly iconic building on the San Antonio skyline. “A well-designed building should look like it was born on the site it inhabits … like it would be totally out of place if moved anywhere else. I think we’ve accomplished that with this project,” said Brown. DC Partners has developed a number of residential projects included Arabella, Astoria, Marlowe. The firm has developed some towers in partnership with Houston residential developer Randall Davis. DC Partners’ portfolio include The Allen, a proposed mixed-use tower on Allen Parkway next to the Federal Reserve Bank.